The 2014 Subaru Forester and BRZ are selling like hot cakes in Canada and have reached the highest sales ever. What is drawing buyers to the two cars? 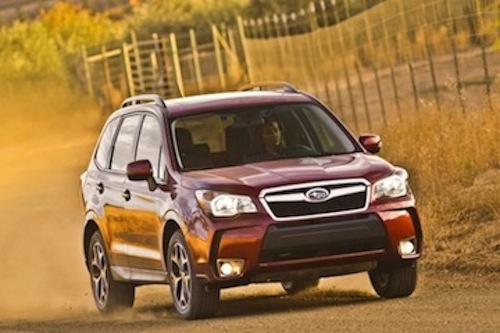 Can the 2014 Subaru Forester get any hotter? The all-new 2014 Subaru Forester sales continue to sizzle, and along with the 2013 Subaru BRZ two-door sports car, the pair have had the highest sales ever in Canada. Subaru Canada reports that their Atlantic, Central and Eastern regions have reach never-before-seen heights in sales. The two cars give the Japanese automaker an overall increased sales boost in April resulting in a banner month in Subaru Canada's 37-year history. Why are Canadian buyers being drawn to the two cars? The all-new 2014 Forester has been completely remade from the ground up and buyers in Canada like the changes. In fact the new fourth-generation Forester is selling well around the globe. In Canada, highest sales ever for Forester make this compact SUV Subaru's best-selling model in April. In the past,Canadians have come to know the Forester as a safe, versatile, and all-weather capable all-wheel-drive SUV and the new model is even better. The 2014 Forester made its debut in Canada with new exterior styling, a roomier interior, improved fuel economy and a new turbocharged 2.0-liter engine. Canadians responded to the redesigned Forester in April and it affected overall Subaru sales in a big way. Subaru reported landmark April results with 3,562 units sold, an increase of 29.4 percent over the same month last year. These record-breaking results represent the company's highest sales ever in a single month as momentum increases towards another all-time annual sales record for 2013. Sales of the next-generation 2014 Forester set a blistering pace as Subaru retailed 1,194 units, an unprecedented 67.5 percent increase over last April. And the BRZ two-door coupe made its mark as Subaru's most popular car for performance enthusiasts with April results soaring 33.3 percent above target. The new BRZ has been praised for its excellent handling because of the low-center of gravity. The Boxer engine design sits low and gives the BRZ a sports car driving experience like that of vehicles three to four times the price. In the past, Subaru designed cars that appealed to a quirky fan base and had a very niche target audience. But the Japanese automaker is now moving into the mainstream and designing cars that will appeal to a new younger generation of buyers. The new XV Crosstrek is a good example of Subaru reaching a whole new demographic with an active lifestyle. And the new 2014 XV Crosstrek Hybrid model gives the brand their first entry into a greener market. This new direction that Subaru is headed seems to be paying off. "April is our greatest achievement in terms of sales increases," said Shiro Ohta, president and CEO of Subaru Canada, Inc. "By far, this is our best month ever! This is exciting news because it arrives on the heels of last month's record results, making huge leaps toward Subaru's overall growth strategy. Continuing to set new records requires a winning combination of dealer dedication as well as the ability to satisfy customers and meet the needs of the market with enhanced product. Subaru continues to break new ground and capture more and more of a very competitive market." Look for Subaru to continue to grow in Canada and around the globe with the 2014 Forester and BRZ. Will they ever catch Toyota and Honda? Stay tuned.